On this day, Aug. 31, 175 years ago, Henry David Thoreau and his elder brother John set out on an expedition from Concord, Massachusetts, in a homemade wooden boat. Over the course of two weeks they traveled first downstream on the Concord River, then upstream along the Merrimack River past Nashua, Manchester, and Concord, NH. 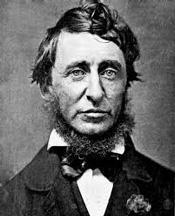 That trip would become the backbone of Thoreau’s first book, A Week on the Concord and Merrimack Rivers, published ten years later in 1849.